Fill A Bag Vintage Sale – Sat 15 Sept! It’s time for another of our infamous MEGA VINTAGE SALES! Buy a stylish and collectible screen printed Paper Dress tote bag for £20 (£15 NUS) and fill it with vintage treasures, it’s as simple as that! 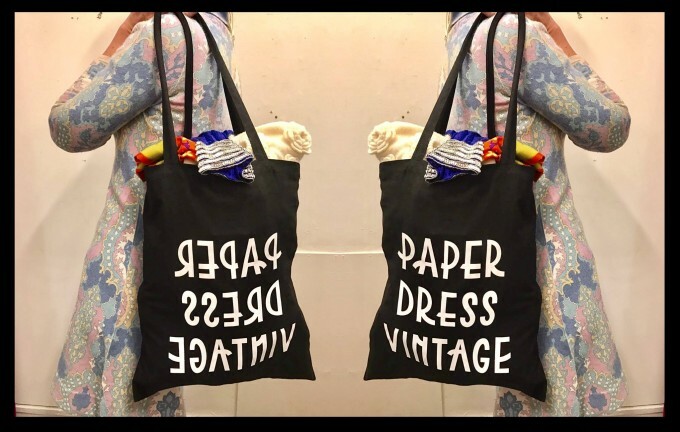 Unlike other FILL A BAG events, all of our stock is hand-sourced and lovely, PLUS you get one of our stylish Paper Dress Vintage tote bags (worth £8 by itself) – double bargain huh?! A great way to stock up on your vintage gems and treat yourself. We’ll also be offering 10% off all the amazing new stock in store on the day so plenty of other great deals and beautiful threads to get your hands on. Tell your friends and get down early, doors are from 10am and we’ll run until stock lasts!